Italian Chocolate flavored coffee is a chocolate-lover's paradise. With flavors of creamy Swiss chocolate, roasted almonds, and a hint of fresh grated cinnamon spice, this coffee features a developed flavor that highlights the deliciousness of these 100% authentic Arabica beans. 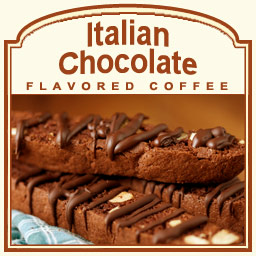 If you like Italian-inspired chocolate, this coffee will make your taste buds melt with its soft, delicious milky cream. Perfect for those that like to indulge in chocolate and nuts, this coffee will hit the spot. Sealed in a heat-sealed valve bag, this fresh coffee will be roasted and shipped on the same day. 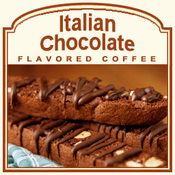 Let the Italian Chocolate melt on your tongue with its roasted and toasted nutty undertones, as a delicious chocolate flavoring pours its decadence over your taste buds. Mmm � delicious! Take a trip to Italy for the best.